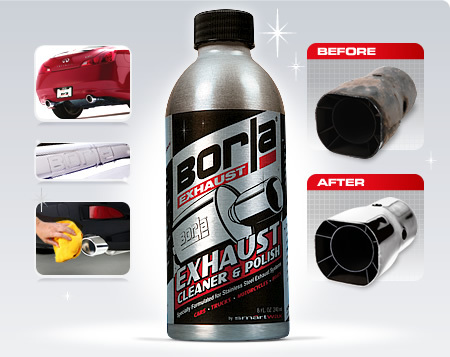 Keep your BORLA® system looking new with BORLA® EXHAUST CLEANER & POLISH. Using a state-of-the-art formula, it quickly cuts through layers of dulling oxides to restore original finish while adding tarnish protection. Use it on cars, trucks, motorcycles and boats, or other household and shop cleaning projects. Also cleans and polishes chrome, copper, brass, aluminum and other metallic surfaces.